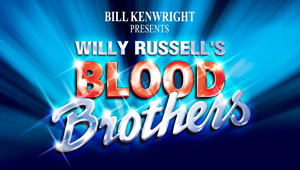 Blood Brothers was originally written by Russell for a school play in 1981, and developed into a Musical in 1983 where we first saw Barbara Dickson play the key role of Mrs Johnstone, produced and directed by Bill Kenwright and Bob Tomson, this musical soon became a smash hit and continues to draw audiences from far and wide in 2018. The story is based around twins Mickey (Sean Jones) and Eddie (Mark Hutchinson), who are separated at birth due to Mrs Johnstone (Lyn Paul), a working class lady who finds herself abandoned by her husband (who has an eye for females that look like Marilyn Monroe) with 7 hungry mouths to feed and one more nearly due. Single mother Mrs Johnstone starts working as a cleaner for a wealthy but infertile Mrs Lyons (Sarah Jane Buckley) when she discovers that she actually has 2 more hungry mouths to feed in her womb. Very quickly a naive but idealistic scenario is discussed with Mrs Johnstone, already threatened by the welfare to have some of her children put into care, and barren Mrs Lyons who asks her cleaner to give one of the twins to her, as she can offer the child everything, which Mrs Johnstone could never do for her unborn child, solving both their problems. The deal is set on the understanding that no one must ever know and the boys must never be aware of their familial ties, based on a superstitious belief that if the twins find out that they were separated at birth, and are actually twin brothers, that they would instantly die. The theme of superstition and fate is in the voice of the Narrator (Mathew Craig), who brings the issue up over and over again throughout the musical, with phrases such as "shoes upon a table", "spiders being killed", "breaking a mirror" or "spilling salt". Mrs Lyons however, invented her superstition about twins, though by making it up she has made it real, seeing the storyline to its full conclusion where the twins do discover their parentage and tragically die in a heart wrenching finale. The story is deep and dark at times, but is equally filled with fantastic Liverpudlian humour, as Russell does so well, showing us the delights of childhood interactions and games as the tale unfolds, with the twins growing up in their different environments at opposite ends of the social spectrum - one becomes a councillor and the other unemployed and in prison. They both fall in love with the same girl Linda (Danielle Corlass) causing a rift in their friendship that ultimately leads to the tragic death of both brothers. The show was held together by the experienced members of the tour who effortlessly played their roles of Mickey, Eddie, Sammy, Mr Lyons and the policeman, and they all delivered on every level. The team however, was let down by the role of Mrs Johnstone played by Lyn Paul, the New Seekers singer of the 1970s who sang pitch perfect but did not seem to connect with the powerful lyrics she was delivering. It made it hard to believe in her role of a desperate mother governed by circumstances and poverty, which leads her to the unthinkable position of giving her child away. Lyn Paul has played this part from time to time for over 20 years but somehow has lost the essence and youth of this character, and did not give a convincing performance. Also the role of the narrator played by Mathew Craig, was flat and lifeless with his unconvincing Liverpudlian accent, his stage presence was non-existent, and he looked bored and emotionless throughout the eveningâ€™s performance. That said the storyline is strong enough to continue to be a crowd puller as Willy Russell has truly written a timeless masterpiece with Blood Brothers. It is a production you can see time after time, and never tire of this emotionally charged epic tale of circumstantial tragedy and loss, where there are no winners in the end. Credit to Designer Andy Walmsley and Lighting Designer Nick Richings for making the set a magnificent part of the overall experience, and Wardrobe Master David Hoy for maintaining the authenticity of youth, fashion, wealth and poverty, again enhancing this brilliant production. A definite 5 star tearjerker suitable for all ages.